In case you haven't heard already, Alex Jones of Infowars.com famously known for exposing government corruption and conspiracies came out again (as he did with Boston bombing and Sandy Hook to name just a few events) and issued a highly suspicious "retraction" on something that is already commonly known to be true. Many of us have witnessed the cycle already. Jones seems to know about a lot of things that his "Intelligence sources" tell him except he's "not sure" of what really happened at Sandy Hook on December 14, 2012. Hmm... So it shouldn't surprise anyone that Jones is putting out this mysterious "retraction" on the D.C. pedophilia operation very clearly revealed in the Wikileaks emails just a few weeks after he made a video admitting he was being threatened by James Alefantis and sounding concerned even perhaps shaken up or afraid of Alefantis and talking about the "chilling effect" he sensed they are trying to implement. I mean, who are we kidding here to think that any of this stuff is natural? 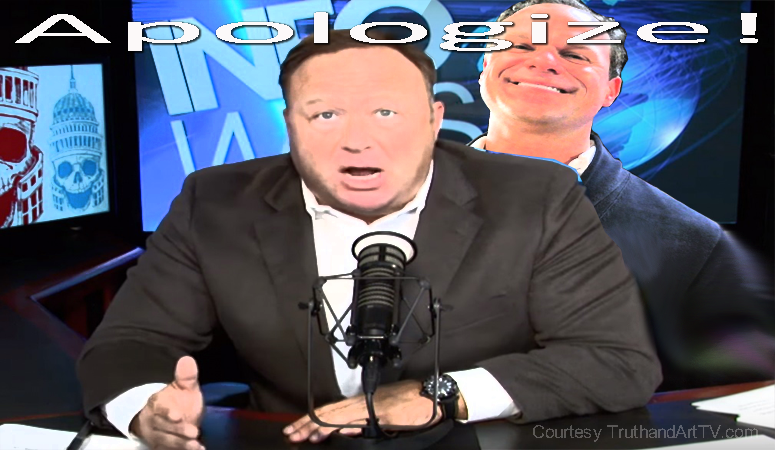 Apparently Alefantis really believes that the Infowars audience, many which are seasoned truth seekers and researchers, would blindly ignore the significance of such a unique video where Jones is clearly indicating there is a problem, a threat, a lawsuit he admits would change the narrative Infowars had taken on the topic. Allefantis and company apparently seem to think that Jones followers would indeed fall for the perfectly timed subsequent Jones "retraction" statements we're seeing now in response to this obvious threat. I suppose Alefantis also believes that the awakening which humanity has experienced and the revelations of potential criminality surrounding people like Alefantis himself will somehow disappear and dissipate because of this strategy. Step 1- An event happens that contains many elements of suspicious activity pointing to criminality and guilt on the part of someone or a group of people who seemingly every single time happen to be connected to government or the deep state. Revealed in this event are their actions, words, previous documented intent, actions shown in videos, images and audios, and actions revealed in key testimonies, scientific evidence, emails (as we saw here!) and gross violations of reason and common sense. Also, notice that these events fail to align themselves organically to the flow of activities, actions and reactions normally expressed and expected in nature. This missing natural and organic essence thus fails to convince the viewer that this was a natural, real, spontaneous (e.g. Sandy Hook) or honest and pure event (e.g. Wikileaks revelations). The evidence of criminality and wrong doing in one way or another then stands out to the clear-minded truth seeker. In other words, an apparent crime is revealed to the populace and the masses who are awakened take in and react to this self evident truth. Step 2- Those who pick up on and acknowledge these revealed activities come from around the globe and include entities like independent journalists, individual researchers and alternative media. Amongst many platforms are platforms with a lot of influence and large audiences such as Alex Jones' infowars.com. Alex Jones and his crew, like everyone else then puts the already established and circulating information out so that people can see the evidence, become aware and (a) jump to conclusions or (b) follow up on this evidence with more research and investigation. In a nutshell this is what the Infowars platform does for a living. At a bigger scale we call this process alternative media or independent media. Probably 99 times out of 100 the information on Infowars has already been picked up by other channels, websites, networks, independent researchers and journalists around the world. This is the beauty of the information age! Step 3- After the initial story is put out, this now spreading information also gets picked up by many others who dig even deeper than platforms like infowars.com because they have either more interest in the story and perhaps more time to cover it. Perhaps these platforms have much less to lose than Infowars and they are not targeted like Inforwars is. There are many reasons one platform covers a topic more than another platform. Step 4- If the topic being exposed is a problem for the deep state or for individuals high up in the chain of command pretty soon Alex Jones gets the call or the contact or the letter or the mail. This could be a couple of days after exposing the criminality or maybe even weeks later but the call or the letter does arrive. Anyone paying attention knows when the message arrives because that's when Jones makes one of those strange "retraction" videos pulling back on everything he said earlier even as highly intelligent researchers and investigative journalists keep digging deeper and explore new information about the event. Is there any one out there that believes that Jones would go through this usual back and forth "information input and retraction" cycle with these king-sized issues in broad daylight without realizing these retractions only arouse more suspicion? I can't prove it but I believe Jones himself is very aware of this obvious cycle that now stands out like a sore thumb. And perhaps this is part of the script or maybe the red herring we're supposed to pay attention to. Needless to say now is not the time to allow someone else to do the thinking for you. So let's continue to the next step. Step 5- The world watches time go by and soon everyone knows whether the people who are SUPPOSED to be doing the investigation are choosing to do their job or not. We're talking the FBI, the local, state and federal police, the Justice system and Congress. As soon as it is clear that the authorities have no intent on doing their jobs (think 9/11) to pursue the truth about the exposed event, the stage then becomes set to demonize anyone who continues to dig deeper into the topic. As mentioned already, this obvious stand down order on the part of the true authorities which could and should be acting on these obvious crimes turn out to be the biggest stories which the system then ignores. In other words, where are the articles by the mainstream media and NPR news talking about how the entire NYPD is a gang of conspiracy theorists?? After all wasn't it the NYPD who came across not only the Podesta emails but the Anthony Weiner emails and announced how horrifying and damning these were? Didn't the information put out by NYPD include among other things "child exploitation"? We should therefore all be asking the question, did someone get paid off since then? But let's keep going. Step 6- When we consider those (like Infowars) who have a large alternative media platform that reaches millions, it then becomes easier (given the scenario in #5) to step back and see how those who are getting away with the criminality exposed in these events can now attack, intimidate and bully these alternative media platforms. Pay attention people, Jones was not the only large alternative media platform that backed off on the pedophilia so called "pizzagate" stories and activities exposed by Wikileaks. And that is because of the real threat of really being sued (Sandy Hook style!!) by the people who are being exposed and who knows what other types of threats. For this reason some called it a "trap". No one should be surprised as this is the only way the ruling elite operate when they feel someone who presents a threat is not listening to them. They resort to threats as usual and as many of us know threats have commonly been made against truth seekers and key witnesses for decades now in America. The list of dead and buried key witnesses and whistleblowers who presented a threat to the ruling elite since the post 9/11 era alone is too long to list here. We are all familiar with many of these names and faces. Step 7- At the lower levels, those who don't run alternative media large platforms with lots of revenue at stake and those alternative media platforms that don't have a presidential candidate on their shows and are not made famous by TV shows and Hollywood, for these smaller scale truth seekers and investigators the tactic employed against Alex Jones and Infowars will not work so easily. These "lower level" truth seekers have no mass revenue to lose in the first place so the perpetrators resort to other threats including- taking down their Youtube channels, taking down their websites, getting them fired from their jobs, conjuring up phony charges against them or even outright threatening them (as we saw Alefantis doing here!). Again, no one should be shocked by this as this is what bullies and criminal psychopaths do. This simple seven step process explains the post Sandy Hook era of Truth censorship that I have been writing about now for years. My friends, please say hello to the new world order model for Truth censorship. You cannot fight back against an enemy until you understand the tactics being used against you. This model (I personally believe) was hatched by the Obama administration, the likes of Cass Sunstein or similar others if not by the JADE 2.0 (as in JADE HELM) software system itself. Many people are not used to thinking and speculating this way but unfortunately we have no choice but to begin thinking this way and start realizing that this is the only way to remain vigilant today. There is a systematic plan being implemented to stifle awareness of anything that is not preapproved by CIA's mainstream media. Since information is now freely available to all and there is no need for any mega-sized information platforms like the corporate owned mainstream media and all of their treasonous subsidiaries, the ruling elite know they'll never ever get the people to submit unless they can somehow control the alternative media information as well. Ultimately, exposing this flow of (manipulated) information and the availability of genuine, easy to confirm information is the primary purpose of my (yours truly) journey in Truth and all my years of writing and exposing the new world order. What I want readers to realize is that the information itself, how it flows, how it's shared and how the masses are lured into believing that one piece of information is true and another is false or so called "fake news" is the very gasoline that drives our consciousness and awareness as a whole. They (the enemies of freedom) know that and so should you. I'm amazed at how we have so obviously come full circle in this journey of truth-seeking and information gathering since the early post 9/11 days when essentially all was hidden. Isn't it amazing? Is there a positive side to this story? To put everything in perspective, consider that all of the Alex Jones forced "retractions" of the past have only served to make truth seekers even more vigilant about that topic (think Boston bombing, Sandy Hook). So instead of being angry at Jones for having the barrel of a gun (figuratively or literally speaking) pointed at his head if he doesn't "retract" his initial coverage of these horrific self-evident crimes being revealed to humanity in this day and age of information awareness, instead see this as yet another confirmation that indeed the smoking gun here is very meaningful, so meaningful that the conspirators are going out of their way to silence truth seekers and alternative media gurus with large platforms (Youtube, Facebook and other social media included). So ask yourself, do YOU now think that the language and behavior described in the Wikileaks emails highly suggestive of pedophilia is somehow less true today because mainstream media and John Podesta says it's all magically "debunked"? Do you think D.C. pedophilia is less true because of this Alex Jones "apology" or because Bill and Malinda Gate's NPR News told you so? This is ultimately the most important question you need to ask yourself. Your answer should be a resounding no because the fact is that neither Alex Jones, David Icke (who directly attacked "pizzagate" researchers months ago) and any other self professed voices of the people riding on large platforms do not and never will control what is truth, what topics are fair game or what independent investigators have the right to point out, discuss and explore. It is not even possible for these people to even suggest that they somehow have inside information on what is true and what is not true any more than mainstream media thinking they have a monopoly on what is reality. The undeniable reality is that we are all free to speak our minds and research whatever we wish. This is what freedom is all about. Freedom of speech, freedom of thought and especially freedom of the press. This is secretly the war being waged here and it also offers an opportunity for many people to wake up to this war for your minds and war against freedom of the press. Once you see the war being waged you'll see that all of this back and forth apology stuff is nothing more than legal nonsense and bullying. Quietly, the biggest trick in all of this is getting you to believe that "Alex Jones" or any single person in the alternative media somehow represents the entire truth and consciousness movement. The system wants you to think that ONE person can control what is revealed to humanity. That's laughable my friends! We're living in a society of word games and labels and in this modern day information war the controllers need you to see the "strawman" of choice which they have selected to represent entire forms of consciousness and then look to them instead of your own amazing intuition and reasoning abilities to determine what is truth. Again, all of this is monkey business! We are all humans and no one has a license for the truth or a special "in" on what's "really" the final truth. Truth itself is self evident and usually easily verifiable. So no one should fall for this trick. When someone says where do you get your news from you should say everywhere. We have an obligation to think on our own! Also, beware of the trap being set up here which I suspect is to get truth seekers to throw out everything Infowars is saying (think American revolution 2.0 and the overthrow of America we've been witnessing for months). So let's examine what DOES Infowars stand for? America, the Constitution, small government, anti-corruption, Christian conservative values, responsible government, restoration of the rule of law and Libertarian values. All of which are major threats to the ruling elite, the globalists, the Communist, the Liberal Left Progressives and their (what I believe based on years of research and personal experiences) "blame Israel and the Jews for everything" psyop movement quietly trolling every alternative media website every single day. Step back and see the only solution to our modern day (no pun intended) information war and that is that every single Truth seeker must think on their own without being intimidated or persuaded in any way. From this standpoint I believe this Alex Jones "retraction" will backfire on the ruling elite. The 7 steps I've outlined above are easily verifiable and is just one blueprint for censoring truth. Ultimately the goal is to isolate those who do seek Truth, those who dare do their own research and those who don't listen and believe someone just because they have a large platform and a large audience. Finally, what all truth seekers need to know is that this war against Truth and independent critical thinking has just begun. I've said it a million times so I guess I'll say it again. Sandy Hook is the model event to begin understanding the future of truth seeker persecution and the censorship of Truth. At this point if you are paying close attention to what's really happening you are probably a much stronger and more discerning truth seeker now than you were before and now that you can more clearly identify their anti-truth new world order blueprint. If you understand this message please share with others.